The price of cards is a mysterious concept to a lot of people. To many, trying to predict them is about as accurate as soothsaying. I’m not entirely sure that it isn’t, but there are definitely some patterns and trends you can use to increase the accuracy of your predictions. Many players ask, “Why is this card going up?” or, “Why is this card going down?” A lot of the time, a little research can easily point you in the right direction. Today I intend to provide a basic framework that can help you answer those questions for yourself. I like to divide all price changes into three different categories: hype, spike, or creep. This is an imperfect system, but it does a nice job of covering the major reasons why a card may be on the move. Depending on which of these factors is driving the price change, you can expect differing outcomes. For each type I’ll discuss why it affects prices, how to recognize it, and what kind of future movement it typically indicates. Hype is one of the most important factors behind changes in price. It can come in many different forms, but the most common is during spoiler season for a new set. New cards often receive the most hype going into a set release but it’s also important to consider what other cards it can affect. In my last article, I wrote about how Harsh Mentor could reinvigorate Burn, but I had no data to support this claim. I realized while talking with my editor that what I meant and what I wrote were not exactly the same. While I had no concrete data to support the claim that Harsh Mentor would make Burn a better deck, I had a strong reason to believe it would make the deck more desirable to play. This is the classic hype scenario. As you can see on this graph, Harsh Mentor was pre-ordering for as much as $12 with no tournament results. That’s the biggest red flag in my mind that this is a hype-based price. Most hype-based prices quickly dissipate as people get less excited when the card fails to put up great tournament results. I generally advocate avoiding pre-ordering new cards because they quickly fall victim to hype pricing and rather to invest in the other cards you will need for whatever deck you’re building. With that in mind, not every hype card ends up being a bust. Devoted Druid is a good example of a card that is actually living up to the hype. When Vizier of Remedies was spoiled, people quickly caught on to the infinite green mana combo that you can make with Devoted Druid. On hype alone, Devoted Druid jumped from $1 to $7—but after the SCG Team Open last weekend put up a 2nd place finish with the deck, it exploded again! Is the price still hype or is it something else now? It’s hard to say at this point. One tournament doesn’t make a deck, but it is certainly looking like it’s going to transition into a spike. The best way to figure out if something is a hype price increase or a spike price increase is to check tournament results. Devoted Druid and Harsh Mentor both started as hype increases but eventually Devoted Druid put up some results to elevate it further. Generally speaking, hype dissipates and the card’s price goes with it. If you are interested in buying into a card or a deck that has been hyped but hasn’t put up results, the worst thing to do is to impulse-buy it. Many people get the idea, “It might keep going up!” and rush to buy a card, which makes it go up even more. That self-fulfilling prophecy is one of the most dangerous scenarios for a buyer—as the price increase isn’t based on real demand, it will almost inevitably fall back down. Many people will point at Devoted Druid and wonder what to do about it. My personal plan for this type of card is just to test it directly in games. Proxy some decks, play with friends, figure out if it’s actually good. Maybe you won’t find the most perfect version of the deck, but if something is there you will probably be able to figure it out. If you tested the deck right after the first price jump, you would have had a few weeks to buy it for $5-$6 before it spiked to $10. Ultimately, waiting will save you more money than buying early. 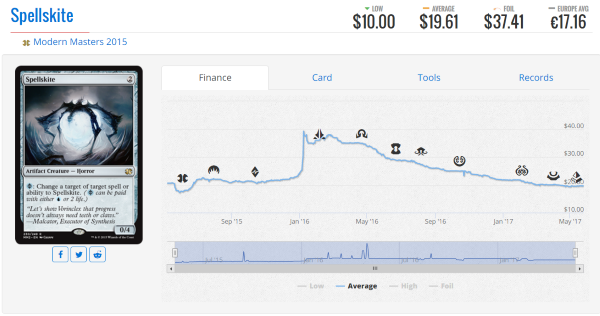 Spike is a common term used to describe any card that rapidly increased in price. I don’t really like using it to explain all of those situations because a lot of the time there are a lot of nuances that get lost in translation. Spikes are caused by an increase in demand or a drought of supply. Sometimes there is a third option, which is a buyout. This is when a speculator attempts to buy up every copy of the card on the open market, in an attempt to artificially drive up prices. At this point, it’s very difficult to successfully buy out any Modern-legal card because there are just so many copies of almost all of them. Malicious buyouts happen almost exclusively on Reserved List cards (all of which are not Modern-legal). Spikes initially will look a lot like a hype increase on price charts, but where they differ greatly is that spikes are driven by tournament-results. If you aren’t paying attention you might miss some exciting decks making Top 8 or Top 16 of a tournament and really pushing demand for the card in the short term. Sometimes people don’t wait for the end of the tournament to buy in and that causes the most problems. Once again, my piece of advice is to avoid buying in immediately if you see the price has gone up a lot. Spikes usually aren’t sustained for long and will eventually go down as people list new copies on the internet. Mishra’s Bauble is one of the better and newer examples of a spike that is driven partially because of its rarity and partially because of its performance. Right now, Death’s Shadow in its various forms is one of the best decks in Modern and the demand for this card is outrageous. Good showings on weekends propel it up, and then it kind of “takes a week off” before spiking again. This is the kind of behavior I expect in the future of this card until it gets reprinted or people figure out a deck that consistently beats Death’s Shadow and it falls out of favor. Right now it looks like it’s on a downward swing, so if you wanted to buy them for a deck then now is a reasonable time. Just don’t buy them during the weekend when it’s doing well at a Grand Prix. The biggest difference between hype and spike is seen when you look at the buylist price of a card. If there is real demand from players and not just speculators, you will see stores adjust their buylist price to reflect the new price of the card. If it’s just hype, they may still adjust the buylist price of the card but it will take a lot longer. Maybe weeks or a month instead of a few days. Creep is by far the least noticed type of price change, but also one of the most impactful over long periods of time. If I asked you to tell me the price of Lava Spike without looking it up, what would you guess? It’s probably a few dollars, right? Maybe $2 each? Nope, they’re $4.50 each! When did that happen, you ask? Well, over the course of three years it went from $1 to $4.50, maybe $0.10 to $0.15 at a time. It doesn’t look flashy and it doesn’t show up on interests pages like MTGStocks.com. This is creep. It’s slow and continuous and it catches you by surprise when you least expect it. Creep is eternal and it is due to constant demand or constant lack of demand. Players want Lava Spike a lot. They might not play Modern and they might not buy 16 copies at once, but they slowly purchase available copies over time and buylists rise to attempt to keep them in stock. What can happen sometimes, however, is cards that creep can suddenly explode into hype or spike. If Burn puts 4 decks in the Top 8 of a Grand Prix, maybe Lava Spike becomes $10 for the weekend. Or maybe some key cards get reprinted in the Burn deck and suddenly there are a lot more people that need Lava Spikes. While it’s hard to say with 100% certainty, I’d guess that the reprint of Goblin Guide and Arid Mesa has propped up Lava Spike a bit recently because it made the Burn deck cheaper to buy. 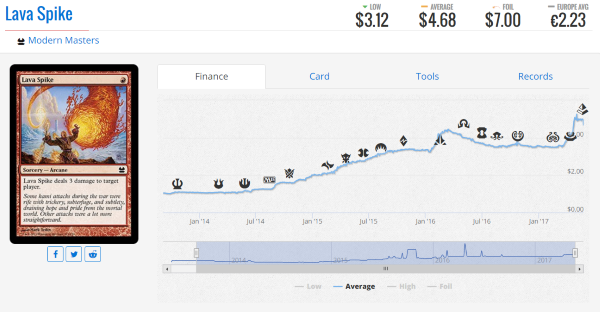 Many people focus on Eidolon of the Great Revel because it went from $6 to $12, but Lava Spike is also a card that has seen considerable price increases since then. If you read my Burn Financial Deck Tech that I wrote in January, I suggested buying Eidolon and waiting to see if Lava Spike was in MM3. Unfortunately, I failed to suggest that you quickly buy it if it wasn’t. You could have saved a few dollars if you needed them. Cards that creep usually continue to creep until new cards are printed or they have a really big breakout performance. While that seems pretty self-explanatory, you can see that for the most part they just continue to creep. Some cards creep down. Spellskite was really popular when Splinter Twin was legal. The banning of Twin had an immediate impact and then threw it into a slow creep down. Infect not being as popular as it once was also lessens the demand on this once-$40 rare to the point where you can buy it for one fourth of that price 17 months later. I’m not expecting Spellskite to see any real movement up in the near future unless something changes. There’s no reason for players to need the card for now. It might plateau at $10 and start increasing in a year or two but it’s still too far away to tell. Ultimately, cards that are creeping are the safest to buy, whether now or later. While you can save a lot of money waiting on hype cards or potentially save some money on spike cards, creep cards are unlikely to really cost or save you a lot of money unless you’re waiting for a specific event. In the case of Lava Spike, I would have waited for the full spoiler of Modern Masters 2017 and then purchased them when it was confirmed they were not in. With Spellskite, the next qualifying event is likely to be a rogue deck or unbanning that causes them to become popular again. I would keep an eye on the MTGO Modern League decklists to see if Spellskite is becoming more favored. Identifying cards you wish to buy and figuring out if they’re currently in hype, spike, or creep can help you make much more informed purchase decisions. Because card prices are not an exact science that can be predicted, it’s still possible you could make the best educated guess and be wrong. That’s the unfortunate part of card prices and why soothsayers like myself try to keep everyone up to date!